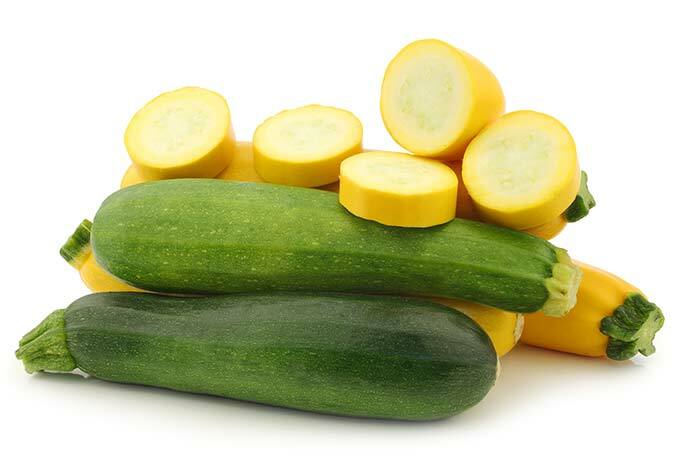 When are zucchini and other summer squash in season? To pick the best summer squash look for ones that are firm and heavy for their size. When 2 zucchini are the same size, but one is heavier, that means it has a higher water content and is fresher (and not dried out). The skin should be smooth and shiny, with no pitting. Choose squash that are 6-8 inches long (for green or yellow zucchini) for the best flavor and texture. The larger ones will have tougher flesh and more seeds. If you do end up with a giant zucchini, they are great for shredding into breads or cooking into a soup where you aren’t looking to highlight the zucchini flavor. To store zucchini, sources are split on whether it should go in the fridge or on the counter. The reason for this is the optimal storage temperature is between 41 and 50 degrees F. Your fridge is usually set to 37 which can start causing ‘chilling damage’ after 1-2 days in the fridge. Chilling damage reduces the quality of the flesh and causes sunken pits on the skin. But storing squash on the counter is warmer than 50 degrees, as are most places in your home during summer. However, storage squash on the counter works just fine for several days, sometimes up to a week (this is how I store fresh squash). Zucchini from Mexico have so few pesticides in the same tests, that they are near-organic levels. Zoodles are zucchini turned into noodles using a spiralizer. Somtimes other vegetables that are turned into noodles are also called zoodles. If you haven’t tried it yet, here’s a very easy recipe from Gimme Delicious Food (along with a short video) to show you how it’s done. Each recipe below only uses ingredients that are in season at the same time as summer squash, or ingredients that have a year-round season. Since their season overlaps with the beginning or end of other fruits and vegetables, the recipes are grouped into early season, late season, or anytime they are available. Tomatoes and zucchini are in season at the same time, and avocados are great all year long. Eggplant and zucchini are in season at the same time!